This spread was entirely too much fun to put together. It was really important to me, but not a lot of my writers jumped on board. I ended up writing a few of the pieces myself, and I’m happy I did. There was great collaboration from the design editor; he put a lot of effort into the layout, even redoing the spread almost completely before printing. The title was also his idea, which we both worked with the photo editor to achieve. Mixed in with the noise of the Saturday market — the excited footsteps, the calling of names, the barking of dogs — is another sound, a mechanic, much less organic sound: a tiny click, clack, click, clack. This is the sound of The Poem Store. The two self-proclaimed public servants sit stagnant alongside the movement of the market, separated from the crowd by an imaginary wall. Every few minutes, someone — a child of six, a couple tied at the waist, a gaggle of friends — breaks the boundary and approaches Curtis and Waterhouse. They are curious; they are searching. For what? A tiny piece of today, spun in synonyms of words they already know, which they can keep for tomorrow. A short story is exchanged between patron and proprietor. The customer names the topic; the poets learn the motivation for the poem and any information the strangers are willing to give. The topics vary. Some are superficial, others deep. Some are tangible — kale, sweaters — and others figurative — love, danger. The people walk away, returning to the ebb of market traffic. The poet sits poised, hands resting gingerly on the keys of his typing tool, eyes staring straight but seeing nothing. Instead, he scans for inspiration from somewhere unspecified, patiently waiting until it strikes and the gentle click, clack, click returns. Curtis, who signs his poems with the initials W.C., was born in Munich, Germany, and moved to the United States in 1994 when he was 12 years old. He affectionately calls himself a migrant. He has lived in North Carolina, Florida, California, and Canada. But his history, he says, is unimportant. Curtis is mostly concerned with his present. Curtis and Waterhouse “currently cohabitate the same space” in Olympia, Wash. 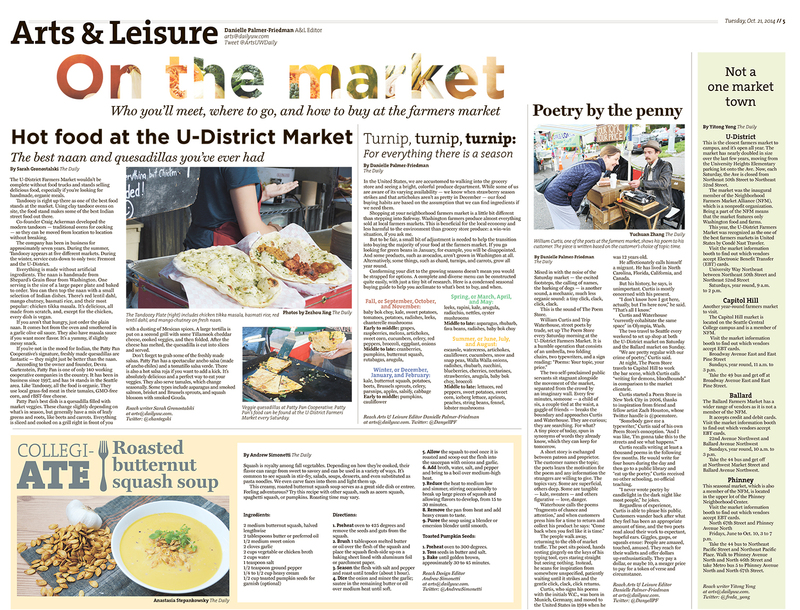 The two travel to Seattle every weekend to set up shop at both the U-District market on Saturday and the Ballard market on Sunday. “We are pretty regular with our crime of poetry,” Curtis said. At night, The Poem Store travels to Capitol Hill to work the bar scene, which Curtis calls “writing for demons, bloodhounds” in comparison to the market clientele. Curtis started a Poem Store in New York City in 2006, thanks to inspiration from friend and fellow artist Zach Houston, whose Twitter handle is @poemstore. Curtis recalls writing at least a thousand poems in the following few months. He would write for four hours during the day and then go to a public library and “eat up the poetry.” Curtis received no other schooling, no official teaching. “I never wrote poetry by candlelight in the dark night like most people,” he jokes. Regardless of experience, Curtis is able to please his public. Customers wander back after what they feel has been an appropriate amount of time, and the two poets read aloud their work to expectant, hopeful ears. Giggles, gasps, or squeals ensue: People are amazed, touched, amused. They reach for their wallets and offer dollars up enthusiastically. They pay a dollar, or maybe 10, a meager price to pay for a token of verse and circumstance. In the United States, we are accustomed to walking into the grocery store and seeing a bright, colorful produce department. While some of us are aware of its varying availability — we know when strawberry season strikes and that artichokes aren’t as pretty in December — our food buying habits are based on the assumption that we can find ingredients if we need them. Shopping at your neighborhood farmers market is a little bit different than stepping into Safeway. Washington farmers produce almost everything sold at local farmers markets. This is beneficial for the local economy and less harmful to the environment than grocery store produce: a win-win situation, if you ask me. But to be fair, a small bit of adjustment is needed to help the transition into buying the majority of your food at the farmers market. If you go looking for green beans in January, for example, you will be disappointed. And some products, such as avocados, aren’t grown in Washington at all. Alternatively, some things, such as chard, turnips, and carrots, grow all year round. Conforming your diet to the growing seasons doesn’t mean you would be strapped for options. A complete and diverse menu can be constructed quite easily, with just a tiny bit of research. Here is a condensed seasonal buying guide to help you acclimate to what’s best to buy, and when.